Even though Google has yet to release an official Google Maps app for Windows Phone, third party developers already offer a number of competent alternatives. One of the most popular ones, and my personal favorite, is gMaps which comes with a comprehensive feature set and, bar its name, could even pass as the real deal. Today, DreamTeam Mobile, the team of developers behind gMaps, announced a new update to the popular Google Maps client. The app now touts further improvements for Driver Mode, Latitude and Street View. Let's go through each, one by one, and see what changed. The gMaps app, which is now at version 2.1, allows users to enable or disable Driver Mode simply by tapping on the location. When the functionality is active gMaps displays a small black car and when it is disabled the app shows a red arrow. When enabled, Driver Mode now also positions the location of the user towards the bottom of the screen as to display more of the map ahead. There are also a couple of bug fixes related to this functionality, including clipped objects/route and "proper rotation of the map pushpins and other objects". By contrast, Latitude in gMaps has undergone less noticeable improvements. According to the team of developers, the only change relates to a decrease in mobile data sent by the app to the Latitude backend. This will likely be felt by users when roaming or outside of Wi-Fi coverage. 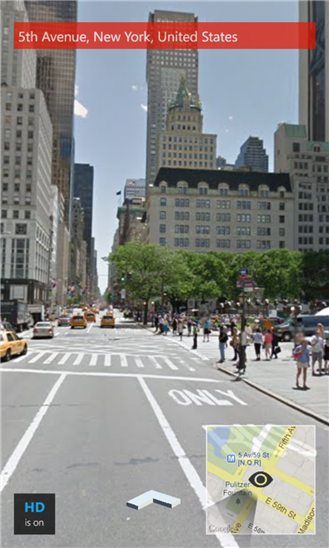 gMaps now comes with support for "full 360-degree panoramic Street View" and the ability to move around when using the feature, with the help of navigational arrows. The app also provides the option to enable high quality (HQ) tiles, which "makes panoramas just great" according to the developers. gMaps is available to download from the Windows Phone Store. The app is free and ad-supported. There is also a paid version which runs for $2.49, but forgoes ads.